I asked my plumber what he would charge to plumb-in a pellet boiler to an existing heating system, and he said it would be about a days work and he would charge me around €400 at most. If I had someone come and commission it for say €250, (commissioning is about 2 hours work on average), that gives a total of about €650. This would represent a saving of €600 on what En Tech are asking. The "Extras" would include a Hopper, and Auger, Flue extention pipes, and plumbing fittings, also maybe a safety system and a flue draught regulator. The requirement would vary greatly between different installations - so it would be impossible to quote one price. But €2360 sounds very high unless you are including the cost of a full double walled stainless steel flue. In many cases all that would be needed is a couple of flue bends into an existing chimney. 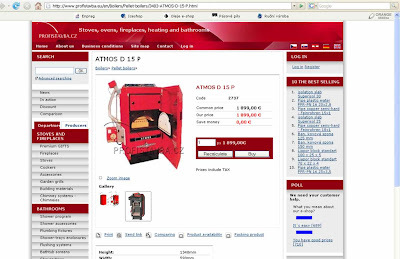 The Czech Republic price for the Atmos D15P is €1899 this includes the local VAT of 19% not too far off the Irish 21%. You could easily ship this boiler to Ireland for around €300 - €400 That's a total of €2300 including shipping costs to Ireland and represents an immediate saving of €1030 on the Irish basic price. If someone was shipping a number of these units the unit cost for shipping could go down to maybe €150 per boiler or less. The Czech Republic is now in the EU so there are no difficulties in doing business. The D20P is on offer by the same shop at €1999 inc. 19% VAT. Add say €400 shipping and the resultant saving is €1361. By my claculations, if I were to import one of these Atmos boilers, get my plumber to instal it for 300- 400 Euro make a hopper and buy a cheap auger, I would come out better than buiying it from En Tech and getting the grant. I would also have no hassle or expense of meeting SEI standards or have commissioning charges. Grants just drive up the prices in my opinion. Commissioning charges are a JOKE. It takes no more to tune and commission a Pellet Boiler than it does an oil boiler. Try asking some punter for several hundred euro to tune his boiler!!! No real surprise that pellet boilers are cheaper in Europe. I was wondering whether you could offer me some advice, I am constructing a 40 sq m modular eco building, airtight, super insulated, lots of solar gain, solar water heating etc. I want to have a backup biomass wood pellet heating/hot water system. All the boilers seem to rated around 10kw and upwards and are big in size. Do you know of any smaller compact less than 5kw rated boilers. Or how about a pellet stove with a back boiler? any help would be much appreciated.